Beef Caldereta gets an extra boost of cheesy to enliven meal time with your loved ones. Try this easy to follow recipe with a twist and be surprised with this hearty meal. 1. Heat pan and oil then lightly brown CDO Ulam Burger Cheesy Beef Patties then set a side. 2. On the same pan sauté onion, garlic, bell pepper and sili labuyo for 5 minutes then add in tomato paste. 3. Continue to cook for a minute then add in potatoes and carrots. 4. 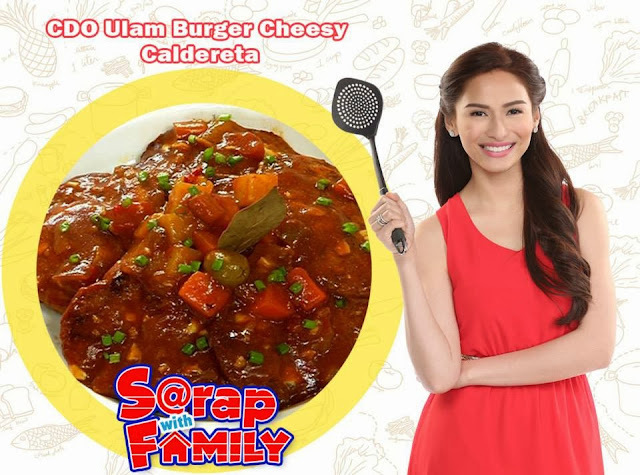 Cook for a minute then add in CDO Ulam Burger Cheesy Beef Patties, bay leaf, tomato sauce and beef stock simmer for 10 minutes then add in green olives. Season with salt and pepper. 5. Serve with cooked rice.